When it comes to women's soccer, Birgit Prinz has seen and done it all. The 33-year-old German forward has been named FIFA World Player of the Year three times (2003-2005), and competed in four FIFA Women's World Cups, leading her country to victory in the final the last two times. Germany's Birgit Prinz is a three-time FIFA World Player of the Year. When it comes to women's soccer, Birgit Prinz has seen and done it all. 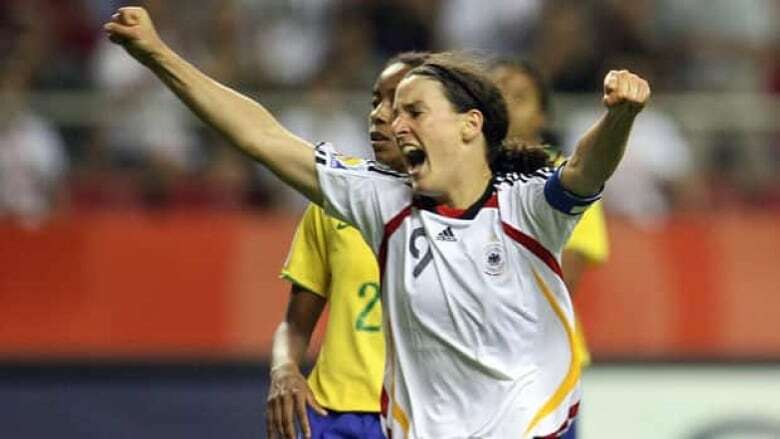 The 33-year-old German forward has competed and won medals at three Olympics, been named FIFA World Player of the Year three times (2003-2005), and competed in four FIFA Women's World Cups, leading her country to victory in the final the last two times. But getting a chance to play at this summer's tournament in Germany is different. This is special for Prinz. Very special. "I think I would have finished my international career earlier if the World Cup [wasn't] in Germany. So, it's perfect for me to get the chance to play in a World Cup at home. I think not many athletes [get the chance] to play in a World Cup at home. I think it's a great, a great thing for me," Prinz told CBC Sports. She added: "I think it's special to play in your own country and I think Germany will organize a really great World Cup." One of the first true superstars of the women's game, Prinz has been a mainstay with the German national team ever since making her international debut against Canada at the age of 16 in 1994, scoring the game winner in the 89th minute. Prinze has scored over 125 goals in 208 appearances for her country, earning praise from teammates, coaches and opponents alike. "She's the most complete player in the world. [She's] a powerful representative of German women's football and a great personality," Siegfried Dietrich, her former FFC Frankfurt coach, once said. A world-class player she may be, Prinz had to fight for respect earlier in her career, even in soccer-mad Germany, because she is a woman. Growing up she was a big fan of the German Bundesliga, in part, because there were no women's teams to follow. Things changed over time, though, and now Germany is one of the true hotbeds of the women's game. "It was not easy for me to have to grow [professionally] here in Germany for such a long time," Prinz admitted. "I'm really happy that now many other players are coming up and are now in the media as much as I am." "Girls are starting to play football much earlier, and train much more, so I think the skills are going up. I think it's much easier to be a more technical player than before … [the federations are] trying to support women's soccer much more than they have done fifteen years ago," said Prinz. As the two-time defending champions and hosts, Germany enters this summer's competition as the favourites. With that comes pressure, but Prinz isn't worried. "I don't think that the pressure will be so different. We are champions, we won it the last two times, so the pressure was high last time, too," Prinz stated. "Honestly, I'm looking forward to having all the spectators in our back, and they're screaming for us and trying to get us forward. So I'm looking forward to it and I don't think that there's so much more pressure than before." Prinz was the top scorer at the 2003 Women's World Cup with seven goals. She followed that up with five goals in 2007. But since the last tournament in China, Prinz has changed her game. No longer the focal point of the German attack, Prinze is now more of a creator, playing farther back in midfield. "My role changed a little bit, I'm not so much the striker, we have other players who are much more up front than me at the moment. So I'm a little more behind and more looking to play a good pass," explained the German.